This coming Wednesday -- Thanksgiving Eve here in the States -- Pope Benedict will receive the archbishop of Canterbury, Dr Rowan Williams, in private audience. Williams attended the inaugural liturgy of Benedict's pontificate in April 2005 and was greeted briefly by the new pontiff at a semi-public audience for ecumenical representatives the following day. However fleeting and public, it was the first-ever meeting between the two theological heavyweights, and next week's meeting will mark the first one-on-one summit between the Catholic and Anglican leaders since Benedict's election. However accustomed churchwatchers on both sides of the Vatican-Lambeth divide have become to visits between the primates of the two communities, it wasn't until 1960, when Bl John XXIII received Archbishop Geoffrey Fisher that the head of the Anglican Communion was welcomed back to the Vatican after a hiatus of 400 years, on account of the Reformation in England. 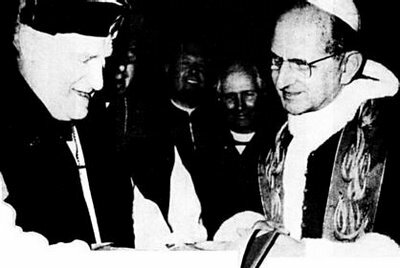 While the one-hour visit between the two marked a watershed, the relationship warmed even further six years later when Pope Paul VI gave Fisher's successor, Archbishop Michael Ramsey, a brother's welcome, leading prayer services with the head of the church of England. Archbishop Ramsey arrived in Rome in March 1966 and, together with his colleagues, stayed with us at the English College. He was received as a friend and fellow Christian - a welcome that blew to bits many of the preconceptions of my upbringing. I received an invitation to the service in the Sistine Chapel at which the pope and the archbishop presided together. You have to imagine the scale of something like this, in which we witnessed the pope in the Sistine Chapel sharing the presiding role with a non-Catholic. And I had a splendid vantage point. As young clerics, some of us enjoyed playing games in the Vatican, such as weaselling our way into the private areas without getting stopped. The way to do this was to walk around as if you owned the place and knew exactly where you were going. On this occasion, I noticed two spare seats in the second row with all the ambassadors, made for them with confidence and sat down. This simple gesture from the pope moved him to tears. Still surrounded by countless local people, the archbishop gave his blessing amid the tears. Later, we all gathered in the English College courtyard to bid farewell to the archbishop and his colleagues. The Senior Student asked the archbishop to give us his blessing. We all knelt down to receive it. As you read this you are probably thinking this was no big deal. But this was 1966 and here were 90 Catholic seminarians in Rome, all in their cassocks, kneeling down to receive the blessing from the Archbishop of Canterbury. I have to tell you we all felt a bit mischievous. Indeed we very much hoped the press would pick up on this event. We wanted our own bishops to see it, since at the time they were not "up to speed" on ecumenism. Like the students of the 1960s we were rebellious, and this felt like our own rebellion. Unfortunately, all the journalists were already at Fiumicino Airport awaiting the archbishop's arrival, so our misdemeanours went unreported. To the last Vatican-Lambeth summit in 2003, Rowan Williams wore the papal ring given Ramsey to his first, and last, meeting with John Paul II. He also donned a pectoral cross the late Pope sent to the then-new archbishop as a gift on his enthronement in St Augustine's chair earlier that year. In the spirit of fair exchange, Williams gave a pectoral cross to Benedict at their greeting the day after his investiture with the Petrine pallium. And while it'll be interesting to how the new pontificate's approach to the gifting custom stacks up against those of its predecessors, even moreso will be if there's a repeat of the 2003 farewell between the successors of Peter and Augustine. Williams genuflected to kiss John Paul's ring and, confined to his chair, Wojtyla shocked the assembled by returning the reverence. A day for close watching, to be sure. As always, stay tuned.